I loved working on this cozy sitting room for my client this month and can't wait to show you the before/after photos once everything has been delivered to her home. She wanted a warm, stylish and kid-friendly space and I am so excited to see it all come together. How does the Interior Design Process Work? If you need help with re-doing a room in your house, the first step is to contact me to set up a consultation. I will ask you to send me some photos in advance and I have a questionnaire form as well so that I can get a sense of your needs and goals for the project. Then I come to your home (my travel area is 45 minutes from Wyckoff NJ so that includes towns such as Montclair, Westfield, Morristown, Glen Ridge, Summit as well as anywhere in Bergen County, Morris County). During the consultation we will discuss improvements that can be made, ideas for furniture and art as well as paint colors. We will look at photos of rooms to get a better idea of what you are drawn to and make a list of what is needed. After the consultation is where the fun starts! I start shopping for what you need and will stick to the budget that you gave me, to come up with an idea board to show you. Once we narrow down the initial ideas of the idea board then I can proceed to create the complete design plan and floor plan. If you are interested in setting up a consultation just contact me and we can get started on creating your dream home! If you haven't yet worked with an interior designer I'd love to go over in more detail how the process works when a client is interested in having me be their interior designer / decorator. The first step is that I ask them to fill out my questionnaire and send me some photos of their space so that I can learn more about what their needs are. We also usually have a quick chat on the phone as well before scheduling the consultation. If you are in my travel area (45 minutes from Wyckoff NJ which can mean towns like Montclair, glen Ridge, Westfield, Morristown or any town in Bergen County or Passaic county) then we set a date for me to come to your home. If you are outside of my travel area then we can do the consultation remotely via Skype or email. At the consultation we will go over what you currently have in your space and what you are looking to accomplish. I love to see photos of what you like and I can show you photos as well so you can let me know your taste. I also bring along all of my Benjamin Moore color samples so that we can discuss paint ideas. I'll give ideas as to furniture arrangement and we may even take measurements too. After the consultation is where the real fun starts because now I can start on creating a design plan and shopping for everything. 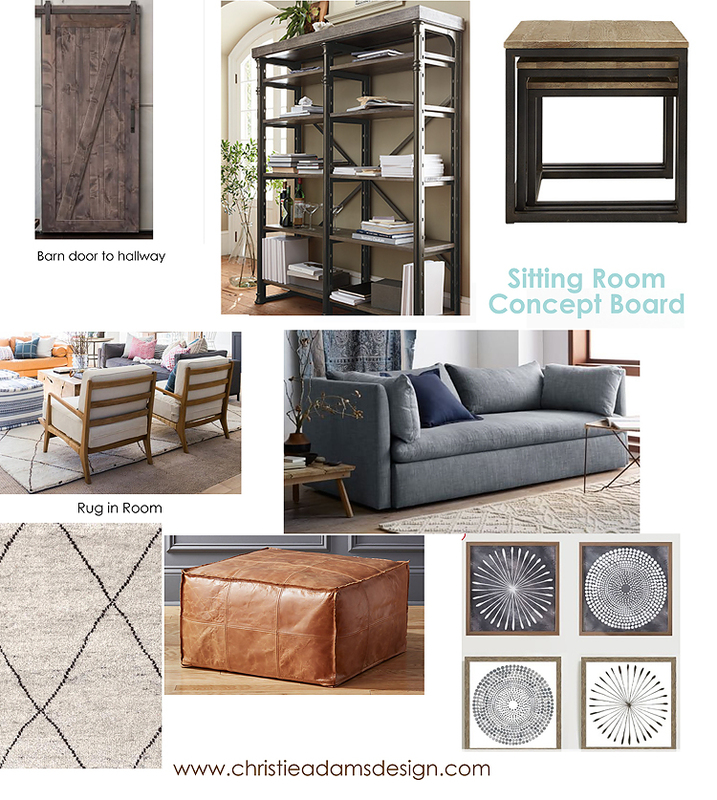 I will present to you an initial concept board with several ideas to choose from. Once you narrow it down I can proceed with the rest of the items. 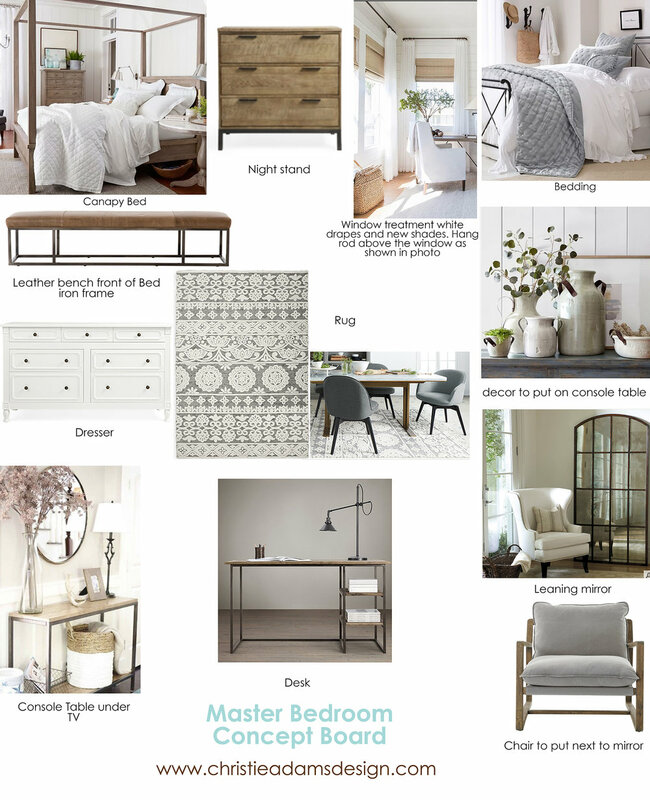 Here is the final design plan for a master bedroom that I can't wait to show you!! The items are all ordered so now we await delivery at my client's home! If you would like to set up a design consultation just fill out the contact page and we can pick a date for me to come to your home. I am on the hunt for black curtain rods for a client and this stopped me in my tracks! 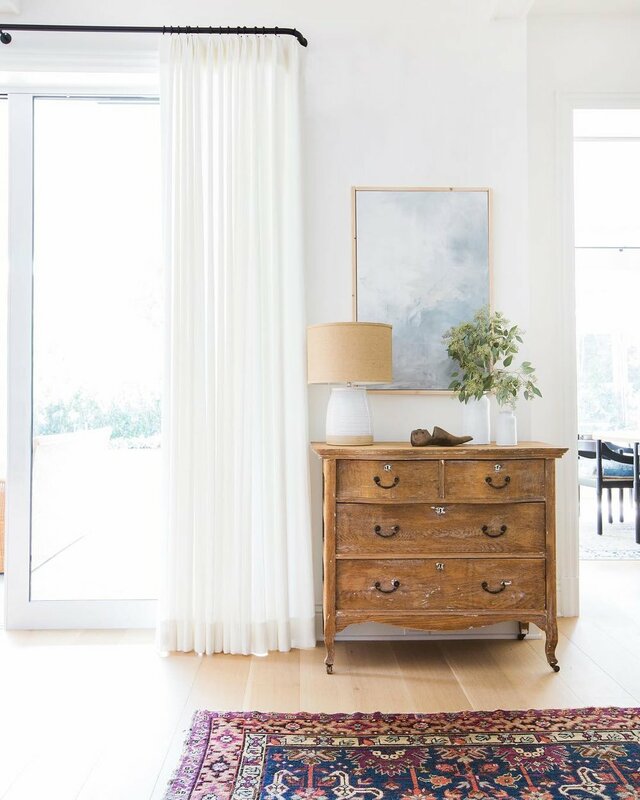 I love the French return style rod paired with the simple white drapes. It is exactly the look I am going for and can't wait to order these! I am also crushing on the beautiful dresser paired with the simple and subtle artwork. I am searching for a new piece for our dining room and would love something like this. I am currently booking design consultations in my travel area which is 45 minutes from Wyckoff NJ (Bergen County). This includes towns such as Montclair, Summit, Westfield, Morristown, Glen Rock and Ridgewood. If you are outside of my travel area I can schedule a consultation via Skype or email where we can design your dream space remotely.